With Disney's remake of TRON coming forward, it'sartmag has realeased a few more pieces of concept art for the film. 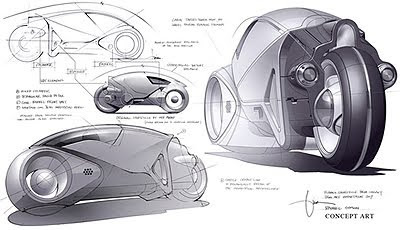 More of this will soon be released in 'The Art of Tron: Legacy' shipping from Amazon on November 16, 2010. Check out a high res preview of David Levy's city environment here. Mesmerizing, delicate sepia toned images throughout from renowned, award-winning artist, Viktor Antonov - production designer and co-author of the French animated feature The Prodigies. The story, taking place in 1875 traces the epic journey of Gabriel Duban in an era before space‑travel when worlds of mystery, danger and enchantment were still found on Earth. Viktor is a winner of the Visual Effects Society and a BAFTA award. In his 11 years in the entertainment industry he has designed and art directed projects such as the blockbuster Half Life 2. The exhibition displays an inspiring collection of fresh illustration and graphic art showcasing over 600 works from more than 60 artists. Over the course of two weeks, the festival celebrates the illustrative arts, presents new talents and trends, exchanges ideas, marvels at progressive technologies, and rediscovers forgotten styles. The Young Illustrators Award encourages and supports designers in their artistic practice and offers an international and worldwide recognized platform for them. A jury, consisting of international art directors, well-known illustrators and publishers, will nominate artists in three categories during the event. NEoN 10 is a seven-day international digital arts festival featuring moving image, performance, music and technology driven arts. The over arching curatorial theme this year is Character: evaluating the abstracted or physical agent in a work of art; investigation of the fictional or psychological systems; observation of the unit of information, symbol, sound or written language. Through this focused dimension NEoN intends to explore the notion of collaboration between visual art, information communication, media production and gaming that will expand digital development and knowledge.